MMO hydraulic driven monitors come along with high quality hydraulic driven motors constructed following principles of MM/2V model monitor's all features which hydraulic driven mechanic motors to orientate the monitors at vertical and horizontal planes. C.S.I. S.r.l. develops hydraulic monitors for industrial facilities with particularly high requirements in terms of ruggedness and resistance to corrosion or where the risk of explosion not permit the presence of electrical wires. In combination with a hydraulic unit and a controller, the monitor can be operated by remote control. It is adjusted vertically and horizontally, within the ranges of the hydraulically adjustable limit switches, maintenance-free hydraulic motors and self-locking gear units. Where a hydraulic system is already available, this version can be used to achieve a coordinated concept. 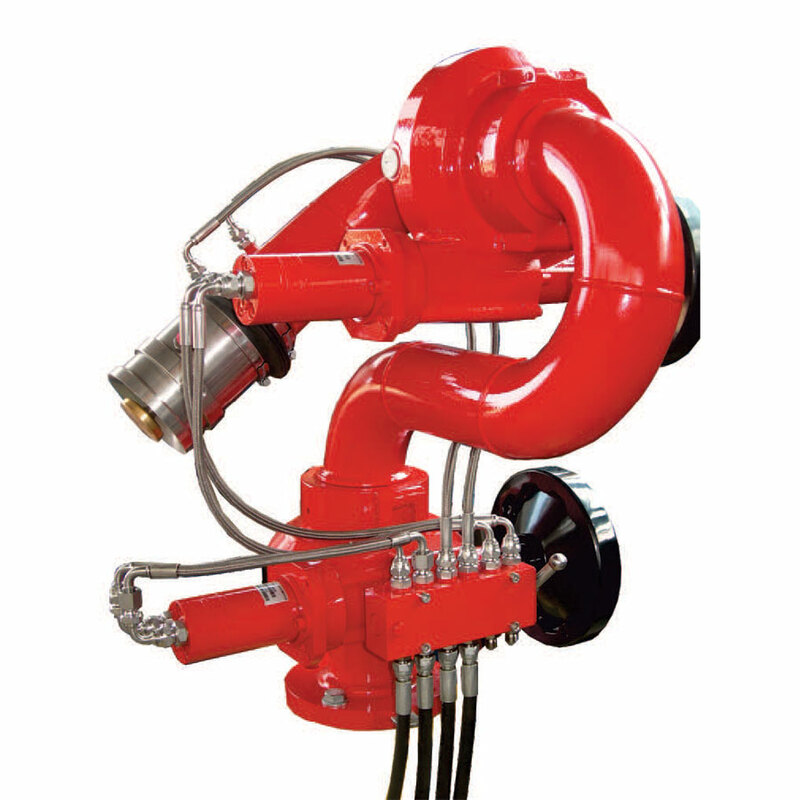 The device is supplied complete with piping to the selector unit for switching between manual and hydraulic operation. On request, we can also supply you with a hydraulic unit and a corresponding electric controller. 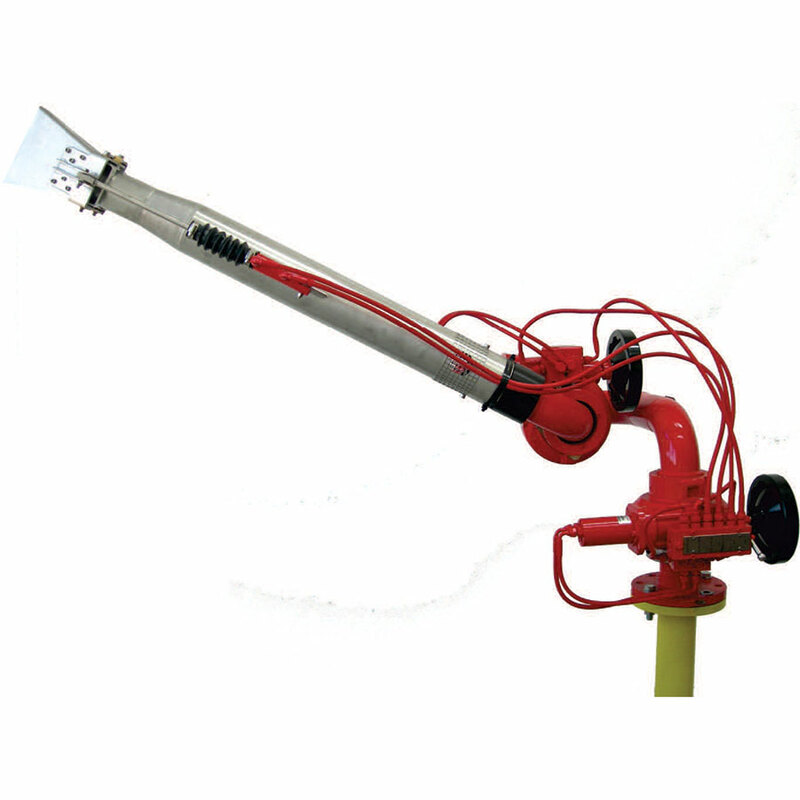 The closed hydraulic system and short-circuit valve ensure that the operator can switch smoothly to the emergency manual operation facility, included as standard, whenever required. This can be done with the ﬁtted hand wheels. The worm gears and spindle gears for the monitors are fully enclosed. The movement transmitted to the shaft passing through a mechanical friction clutch, works as a mechanical movement-limiting device. When movement limits reached on vertical plane or horizontal plane, the friction clutch absorbs the movement energy and cuts the transmission of the movement to monitor at while the hydraulic motor keeps on rotating. MMO model hydraulic monitors are the only equipment, which controlled remotely can provide 360° continuous movement with its special engineered design. To move the monitor in one direction, only hydraulic oil ﬂow is needed at a rate of approximately 3 l/min for each motor movement with residual pressure 40/60 bars. The transmission shaft comes together with hand wheels, which connected, directly to the movement mechanism to use the monitor in case of failure. To use manual hand wheels C.S.I. S.r.l. supplies a mechanical oil by pass block on board the monitor to release the pressure existing on the hoses which obstacles movement. Hydraulic monitors delivered pre-piped with ﬂexible hydraulic hoses from the bypass block up to the movement motors. Only requirement customer to connect hydraulic ﬂow carrying hoses and enter the slots left during installation. ATEX versions are available on these models. While standard working temperatures for monitors are -20/+50°C, for extremely cold environments, C.S.I. S.r.l. adapts raw material speciﬁcations to satisfy functionality of the equipment up to -60°C with low temperature steels, alloys etc. MMO model monitors have 3”-4”- 5”-6”-8” waterway passages enable the whole monitor system to handle ﬂow rates up to 40.000 l/min. with combinations of various discharge devices available from our product range.